We're talking about gifts this week! 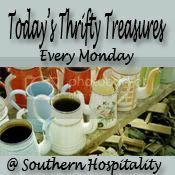 Things to be on the lookout for now amidst your thrifting to make the holiday gift giving a little less expensive and hectic. I have a couple of trays I used for some inspiration~this one I bought almost 10 years ago at Target and have used in various places throughout my homes~right now it's being used on the kitchen desk as a little catch all for the school calendar, my daily planning notebook, Webkinz codes, a little Darth Vader whose cape we're on the hunt for, health insurance cards that need to go into our wallets, and coupons that need to be put in my little purse coupon file. 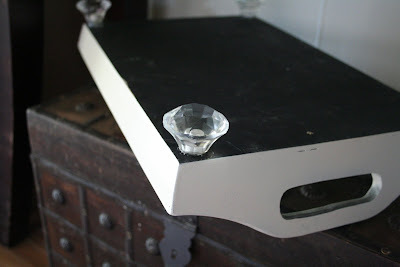 I got these little knobs at Hob Lob for half off that I am going to use for tray feet. If you can find any that are missing the screw, even better. They gave me a couple for free and it saved me from having to break them off. The other two I paid $2 each for. 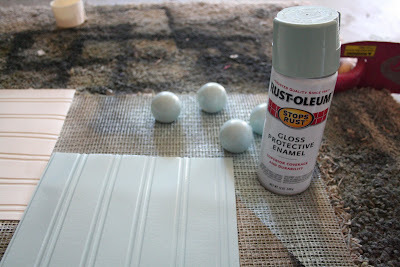 I spray painted a piece of the paintable beadboard wallpaper cut to size a bluish greenish color called Glacier Blue. It was on clearance at Walmart and I may just have to run back to see if there is any left~I love this color! Need some more tray inspiration? 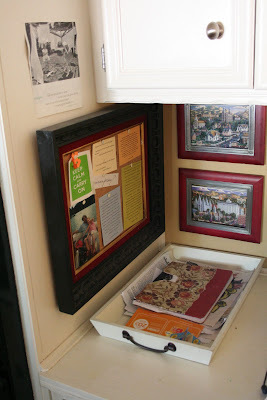 I know there are many more tray ideas out there in blogland. If you have one, or know of one, feel free to link it up below so we can see! I love trays. And your make-over is fabulous! I appreciate you linking my blog. Thanks! Hi Melissa!! thanks so much for the link. I LOOOOVE the idea you had for using the knobs as "feet." 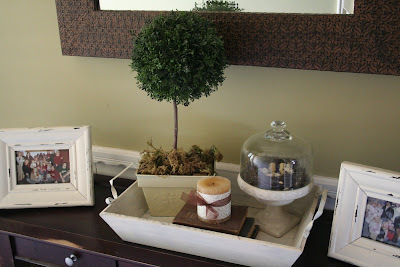 The tray I made from an old frame that's on my dining room table could really use some feet, so I'll give that a try. love it! great ideas. your home is so beautiful. 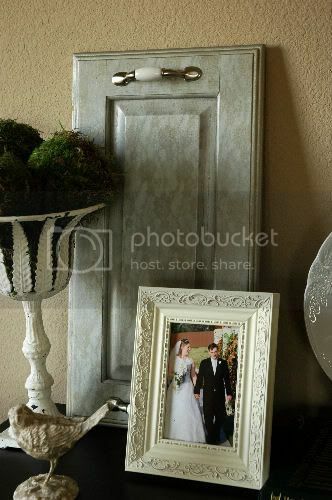 I love your two Target trays; the one in your hallway is a nice addition to the decor you have there. Love the Glacier Blue color as well. 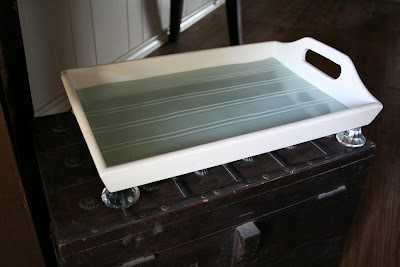 Trays are a great idea for gifts - I guess I'll be looking for great looking handles and knobs! fab trays!!! i have been looking for a perfect one for my bathroom. you gave me some great ideas and inspiration. 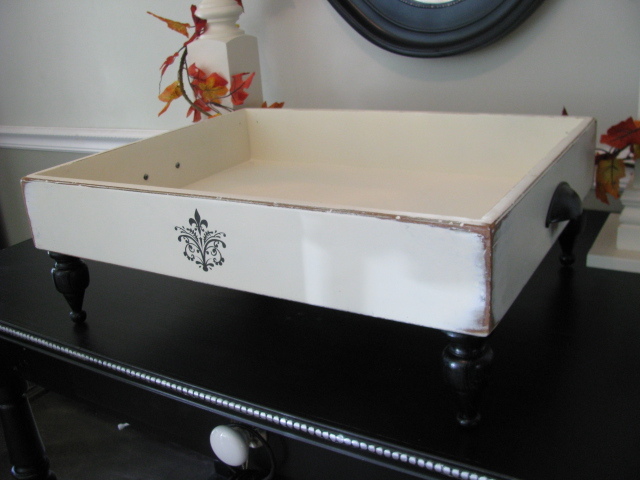 Love your trays... and I think they make great gifts! Imagine one piled high with homemade food goodies or inexpensive office supplies, wrapped up in celophane and tied with a big bow. Lots of bang for not too many bucks! Love it! 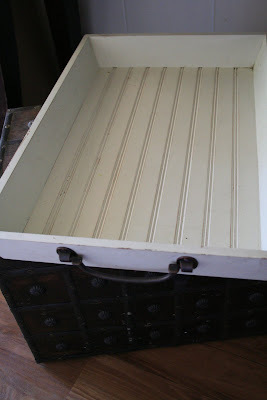 I have a lot of trays I have gotten for next to nothing at yard sales and they are just waiting to be redone. I have got to add some cute feet like you did! That's adorable, Melissa! And another great idea for that beadboard wallpaper. I'm gonna have a beadboard wallpaper party soon, so stay tuned for that! Love love your tray ideas. I'm gonna be keeping my eye out for them. I feel some christmas gifts coming on. ok, I just have to say i LOVE your "week of gifts" i'm so excited and can't wait to start making some of these! thank you! I LOVE Glacier Blue paint and cannot find it anymore! Maybe I'll luck up and find some on clearance at Walmart too! Celery is another that is really pretty like Glacier Blue. It's soft and not very intense. I love trays sooo much and yours are so neat!!! Love them! Those are some great ideas! I love trays, too! I will definitely be on the lookout for some to re-do! So creative and a wonderful gift idea!!! Love trays!! Some great ideas here! 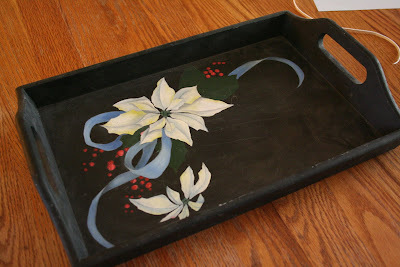 I bought a tray a while ago with the intention of refurbing it and haven't gotten around to it yet, maybe soon! i love these ideas! i have a couple i could use, and i will have to choose which i idea i want to use! Yours is really pretty, love the blue. No one EVER has glass knobs here. The only ones I can find are the $5 a piece ones at Lowe's/Home Depot, or the acrylic ones at Target. No Hobby Lobby here :(. A couple months ago, Joanns had some for $1 a piece, but I didnt grab any, and I really should have! DH works in the cabinet business and can get me free doors... I could try that door one! I never find these darn things. What an amazing idea. I can't wait to see what else you show. I have a few trays that I've purchased but haven't gotten around to "beautifying" yet. Thanks for all the inspiration!! I am just a blog lurker and I LOVE your blog! You always have such CUTE ideas! One thing I have been admiring for a long time is the fun temple prints you have hanging above your desk. If you don't mind me asking, where did you get those? Thanks for having such an inspiring blog! Hello Melissa - love your trays! I need one for my kitchen counter as a "catch all" too. Great idea. 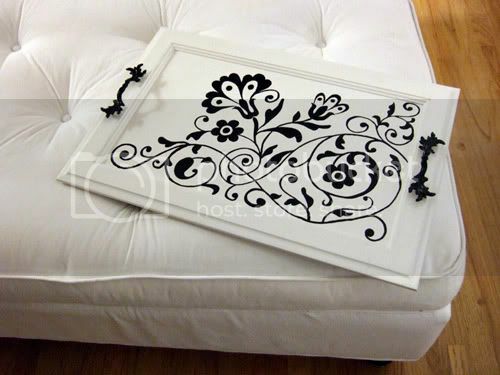 I love the tray with the glass knobs as feet. Fabulous job! I, too love trays! Covered mine with wallpaper, but next time I find one I am giving it a cute treatment like yours! I love your trays! It's so funny that I just finished my tray and posted about it today. Thanks for posting about gift ideas this week. I'll be checking back everyday for more ideas. I'm close to obsessed with trays. Yours turned out too cute! Fantastic trays!! How inspirational! I'm so glad I found you from Rhoda's blog. Mad talent!! Love it. Blessings. 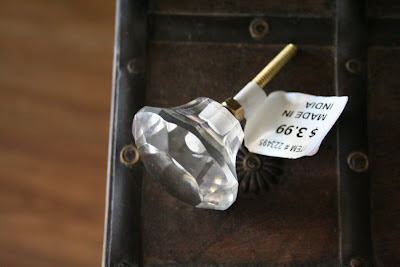 I came across this post on Pinterest and I love it - as I use cabinet knobs for all sorts of things other than cabinet doors. 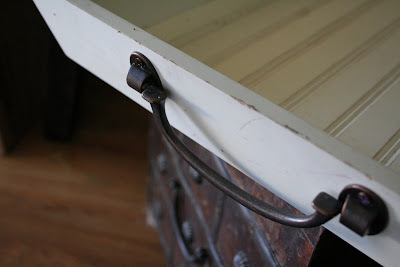 I'm currently working on a blog post about creative ways use cabinet knobs and was hoping you'd allow me to feature this project on Two It Yourself (www.twoityourself.blogspot.com) Thanks!